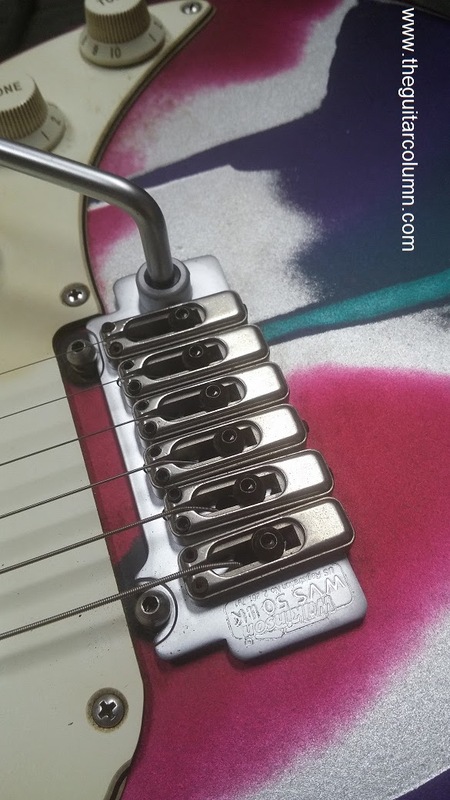 Back in July 2009 I mentioned getting a Wilkinson WVS 50 II K bridge to replace the original Wilkinson VS100 bridge on my James Tyler Psychedelic Vomit. And guess what? I'd just got around to swapping out the bridge a couple of weeks ago in time for my Monday night gig, slightly more than six years to the date I bought it. The Tyler Psychedelic Vomit had been one of my main gig guitars for a good eight years since 2001 until the corrosion on the original Wilkinson bridge got a little out of hand. Or more precisely, all over my hand. 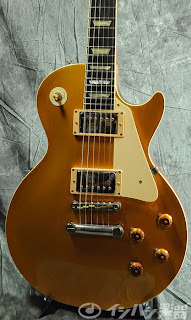 Rather than risk blood poisoning -- the side of my right hand would turn rust brown from playing the guitar for any length of time -- I put the guitar away, telling myself I would install the new bridge soon. 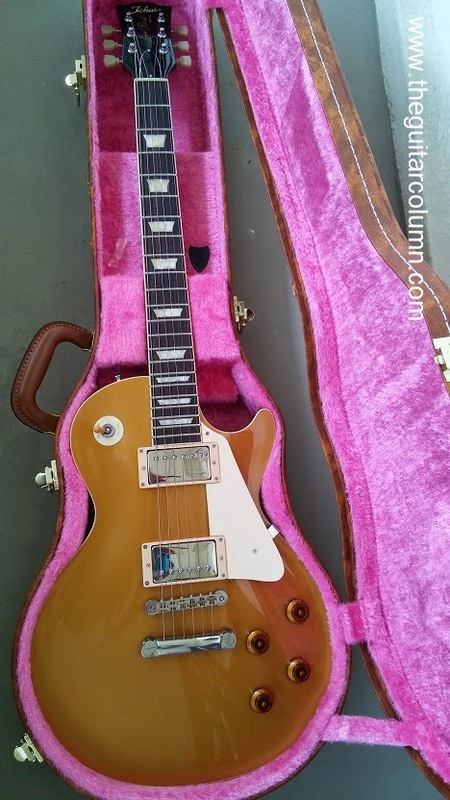 Since then, the guitar has been sitting in a corner of my music room on a guitar stand in semi-retirement mode while I flirted with various Fenders, Suhrs, Firebirds and Les Pauls. 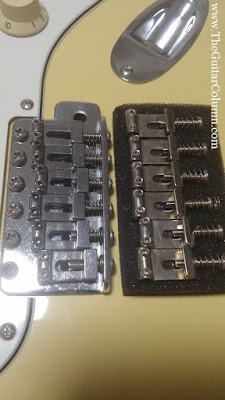 The original Wilkinson bent bridge saddles that came with the Tyler are similar to the current Wilkinson/Gotoh VSVG vintage tremelo but with the VS100 two-pivot point baseplate. The original Tyler Psychedelic Vomits came with the VS100 tremelo, with saddles that were solid blocks like the ones on the WVS 50 II K. But around 1999, when I bought this particular guitar, Jim Tyler decided to switch out the saddles with the then-newly available Wilkinson bent saddles while keeping the original VS100 bridge baseplate. 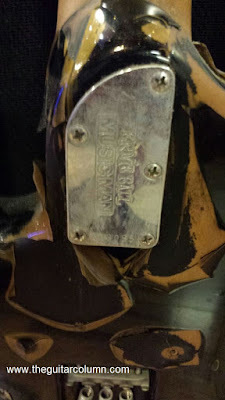 Interestingly, this particular bent saddle/VS100 baseplate combination was never made available commercially -- the bent saddles always came with the traditional 6-screw plates. Theoretically, replacing the original block saddles with the lighter, low-mass bent saddles would give a brighter, vintage, more resonant tone. In practice, I don't think anybody can really hear the difference. 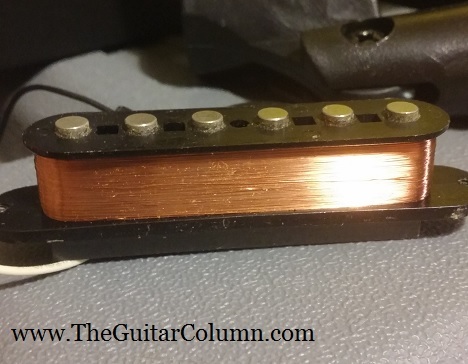 To me, it's the baseplate and tremelo block that make any kind of audible difference as far as Strat-style bridges are concerned. And even then, the differences are subtle at best. Initially I thought of keeping the original Wilkinson VS100 baseplate and simply replacing the bent saddles with the block saddles from the WVS 50. But just from looking at it, I could see that the black screws holding the block saddles to the baseplate were a different size and length. 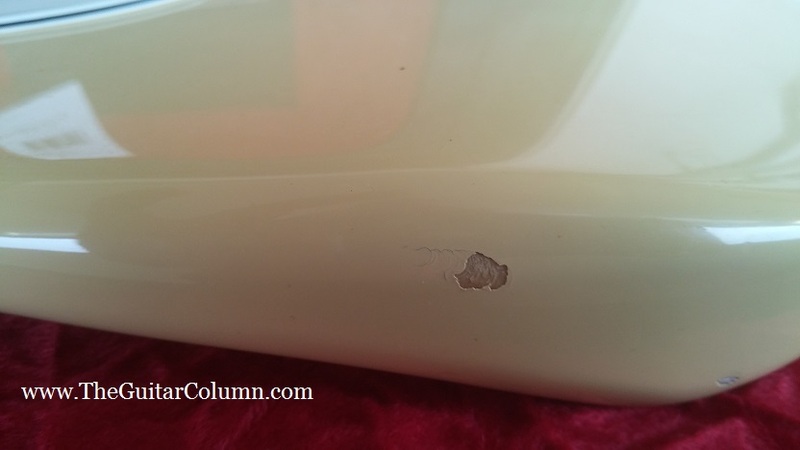 Anyway, the original baseplate screws securing the bent saddles to the baseplate were seriously corroded as well. How the heck did this thing get so rusty? Rust in peace, old friend.. Instead of mucking about any further with baseplates and Imperial versus metric size screws, I decided to just swap out the entire bridge. 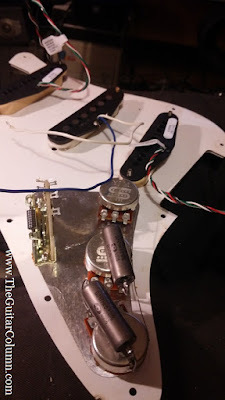 I loosened and cut off the old strings before removing the three tremelo springs from the spring claw in the trem cavity. With a little maneuvering around the bridge posts, the old bridge came off, releasing a generous sprinkling of powdered rust everywhere, like a final farewell. Note to self: Never, ever, remove rusty guitar hardware in bed. Ever. Out of curiosity, I unscrewed one of the bridge posts to see if there were metal bushings anchoring the bridge posts to the body and I was happy to see the glimmer of a shiny, like-new brass insert. 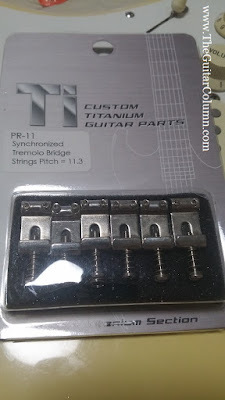 I could never understand how some bridge manufacturers would choose to use simple wood screws without metal bushings to hold bridge posts that would have to cope with string tension and constant friction during use. That's a lot of stress put on them. The earlier versions of the original Floyd Rose trem, for example, had wood screws anchored directly to the body. No wonder the more vigorous exponents of the Floyd found themselves having to have their tremelo knife edges professionally filed and resharpened every few months just to stay in tune -- small movements in the wood screws probably caused the knife edges to get chewed out sooner. Like in the case of Steve Vai, who claimed to go through a new Floyd Rose trem every week on his Green Meanie guitar! 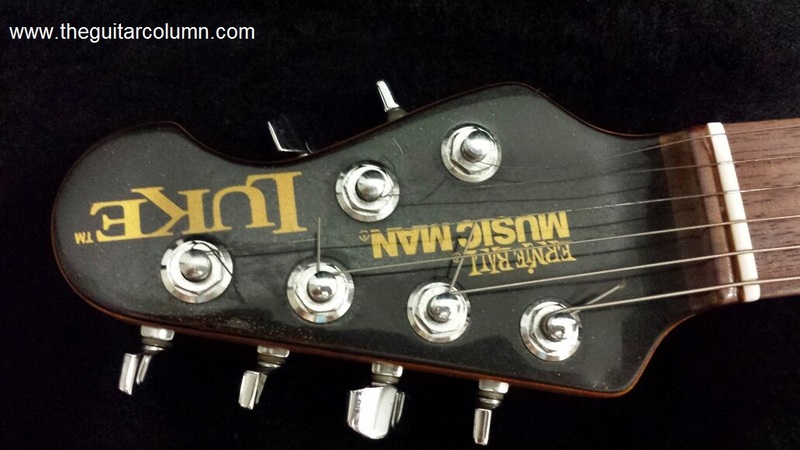 Ain't nothin' worse than a Floyd that won't return to zero after a dive bomb or stratospheric harmonic up pull. 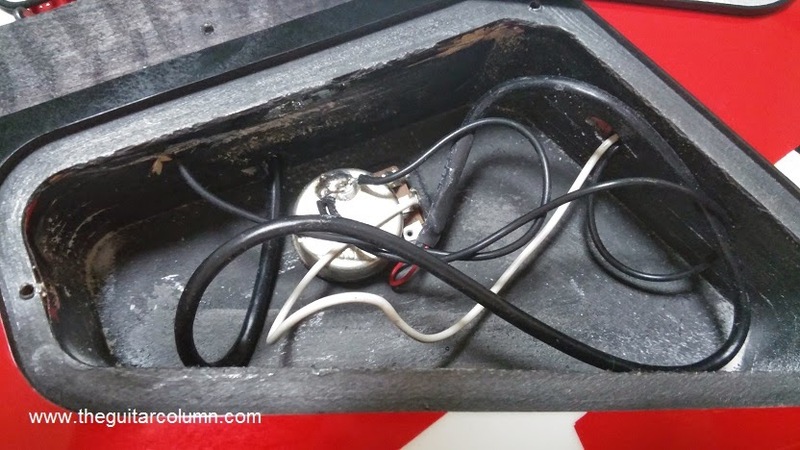 With one of the original bridge posts out, I tried to see if the bridge posts supplied with the Korean-made WVS 50 II K would fit. 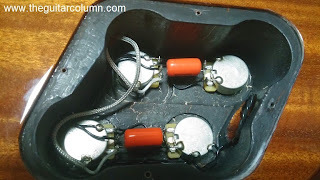 I found the WVS 50's posts much larger and if I wanted to use them, I would have to remove the original bushings and drill larger holes in the guitar's body to accomodate the larger bushings. A major modification, and unnecessary. 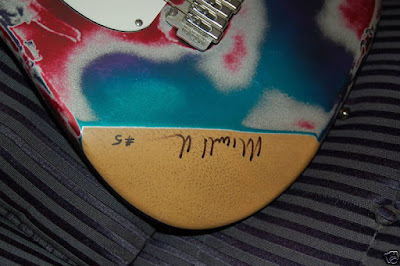 Not that I would have the skill, tools, or the daring to carry out such a mod on a Tyler guitar! I cleaned up the slight bit of gunk buildup off the original bridge posts with a toothpick and cotton bud and lubed up the groove where the bridge would contact with the posts with Graphit-All. As expected, the new Korean Wilkinson bridge worked fine on the US-bridge posts, pivoting nicely once the tremelo springs were reattached. I tried to see if the original VS100's tremelo arm would fit the slot on the new bridge, and it did. 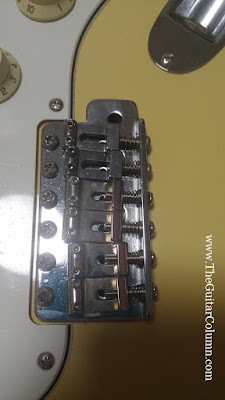 The only thing was that the VS100's trem arm sits unusually high on the WVS 50 bridge -- the tremelo arm slot on the VS100 is about an inch deeper. The tremelo arm that came with the WVS50 is made from a hollowed piece of metal but works just fine. Imperial Versus Metric - Why, Why, Why? And this was where I came upon a major problem. The bridge posts must have moved when I was cleaning them because the guitar's action had become unplayably low for some reason when I put a pack of fresh strings on. I needed to raise the two bridge posts and the metric-sized wrenches I had on hand were either slightly too large or slightly too small. And my old set of 16ths of an inch, US-sized hex wrenches were nowhere to be found. 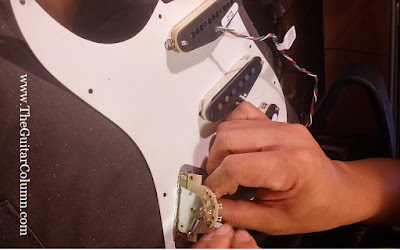 Since it was a Monday, and I really wanted to play my Tyler that evening, it dawned on me that if I was to loosen the strings, remove the bridge and adjust the bridge posts by hand, I could very possibly raise the action up to where I needed it to be! Fortunately the Tyler came with locking Sperzel tuners so the strings remained firmly attached at the tuner end when the bridge was removed. I managed to turn the bridge posts, bringing them up by just a hair before they refused to turn anymore without a proper tool. 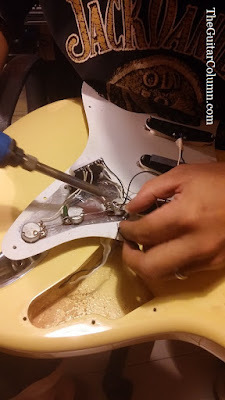 Reattaching the bridge and trem springs, the action was still too low but playable, without fretting out too much on string bends. I deemed the setup gig-worthy but decided to ask my good buddy Keane to see if he happened to have a non-metric set of hex wrenches. He said that he might and would come by my gig that night with a few different sized wrenches. I was a little uncomfortable playing the first set with such a low action on the Tyler, having to watch my bends on certain notes that were most likely to fret out. But thankfully Keane showed up the during the middle of the set and I was able to do a quick adjustment, raising the action up to where the Tyler could wail uninhibitedly once again. Thanks Keane! Both you and Liverpool rock! As expected, the WVS 50 II K performed very well, from subtle wiggles to divebombs. 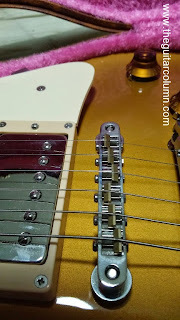 Frankly, I could not tell the difference in tone or sustain between this Korean-made bridge and the old US-made VS100. But I did notice that the WVS 50 feels a little more solid when I rest my hand on it and the block saddles feel smoother unlike the bent saddles. Or maybe it was all that rust on the old VS100. 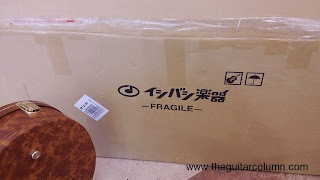 I recently ordered an EVH Striped Series guitar from Japanese online music store Ikebe-Gakki and received it in the post a couple of days ago. This is my first time dealing with Ikebe-Gakki and I must applaud them for the quality of their communication and their prompt replies to my emails. They only accept payments by bank wire transfer for purchases from outside Japan, though, making a schlep to the bank to fill out forms necessary. 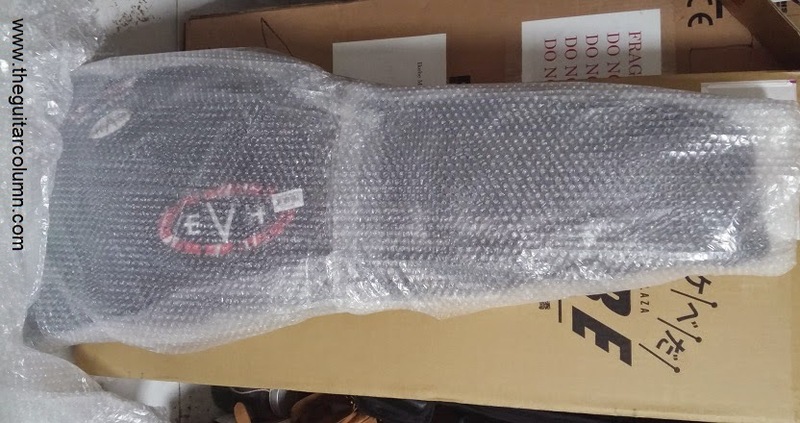 The EVH Striped Series guitars ship in a softcase so I requested that they pack the guitar with extra layers of bubblewrap to ensure it got to me in one piece. And did they pack it well! 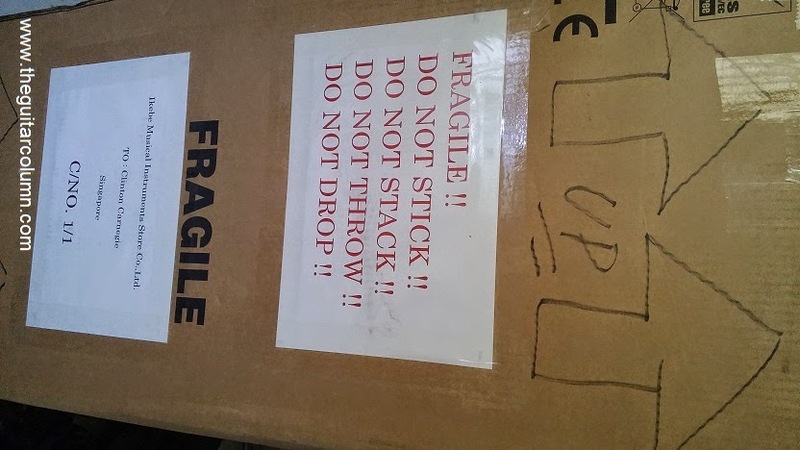 The guitar was shipped thoroughly bubble-wrapped and double-boxed. 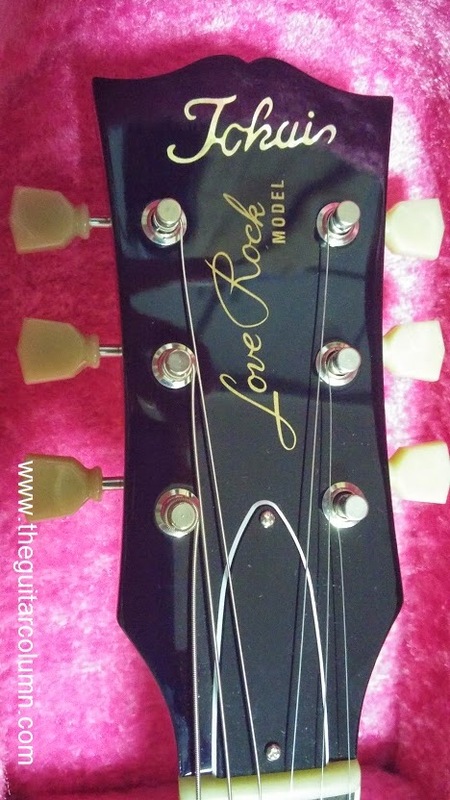 And despite the Floyd Rose nut not being locked, the guitar was actually pretty much in tune when I took it out of the softcase, with only the G and the B strings slightly flat. Ikebe-Gakki will definitely be seeing more business from me in the near future. Carton within a carton and generous amount of bubblewrap! The Mexican-made EVH Striped Series is manufactured in Fender's Ensenada factory. Fender Mexico has really upped their game in recent years -- the Roadworn series in particular, stick out as very well-made instruments with tons of vibe. 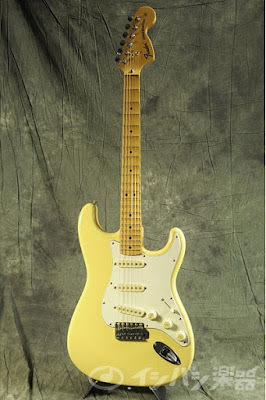 In my opinion they gave more bang for the buck than any relic'd guitar from the Fender Custom Shop. Eddie Van Halen is well-known for being very hands-on with the design of every guitar model that bears his name, choosing wood combinations, hardware and voicing pickups. He is also legendary for giving guitar manufactures a hard time whenever he visits a factory, simultaneously striking fear and a sense of awe into the hearts of those who happen to be tweaking guitars in the final setup department on that particular day. I reckon it was his early experience with Kramer in the 80's where only his name and likeness were used in ad campaigns to sell guitars, with virtually no creative input from Eddie himself, that set him on a tangent of being very involved in the design and manufacture of every one of his guitars and amplifiers, from Ernie Ball/Musicman, to Peavey, and now, Fender EVH. In all honesty, I can't recall ever having played a bad guitar or amplifier that had Eddie's mark on it. To think that Kramer missed out on a golden opportunity, all those years ago, to recreate an Eddie Van Halen signature model, stripes and all! The EVH Striped Series guitars are available in three color combos -- black stripes on white, yellow stripes on black, and the iconic red, white and black. All models feature a hand-rubbed, oil-finished quartersawn maple neck with built-in graphite reinforcement rods, an easy access trussrod adjustment wheel at the base of the neck, Stratocaster headstock, jumbo frets, EVH-branded tuners, basswood body, Wolfgang humbucking pickup, single volume control via an EVH-branded 500k low-friction pot, and side-mounted output jack. 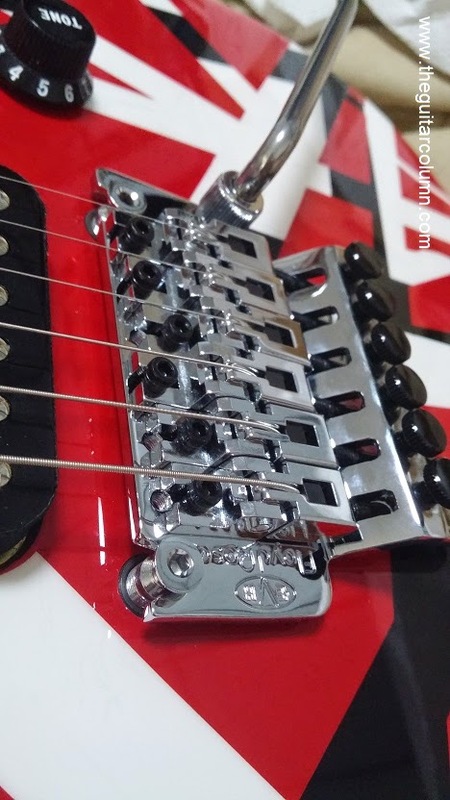 Of course, the Striped series just wouldn't be EVH enough without a Floyd Rose bridge. 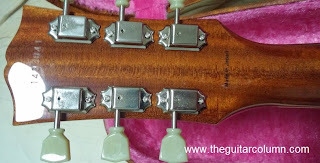 The necks on these guitars are devoid of any kind of finish other than a couple of coats of oil applied at the factory. Oil-finished necks, or any neck that has not been hard-finished in lacquer or polyurethane, are prone to shrinkage, expansion and warping, depending on the relative humidity the instrument is stored in. 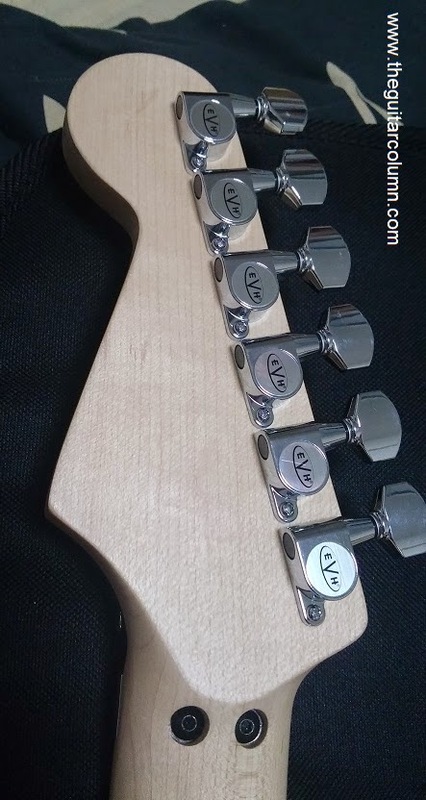 All EVH Striped Series guitar necks are carved from quartersawn wood for the simple reason that quartersawn necks are much more resistant to twisting and warping than flatsawn necks. And if you're dealing with an oil-finished neck, quartersawn is much more stable and definitely the way to go. You can tell a quartersawn neck from flatsawn by the vertical grain pattern and visible row of 'quarter flowers' running down the centre of the neck. And to make doubly sure the neck on your EVH guitar lasts through years of sweaty gigs, the built-in graphite reinforcement rods add even more stability. 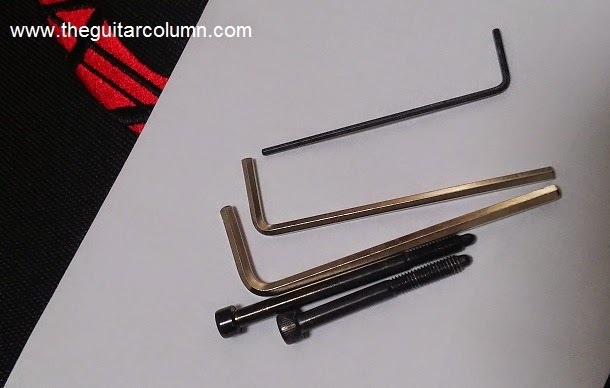 Graphite is so stable that some companies like Vigier guitars have even done away with trussrods entirely, relying on graphite rods to keep their necks stable and fingerboard relief constant. The first thing that struck me when I picked up the EVH Striped Series was the neck profile. This is the neck that vanished from the face of the earth! In 1987, when Ibanez released the first Steve Vai JEM guitars in that lurid Loch Ness Green, I remember trying one out and being immediately amazed by the profile and feel of the neck. Even before plugging it in, I wrapped my hand around that neck and I just knew. But the mystic, magical properties of the original Loch Ness Green neck was forever lost after that limited run of seven hundred and seventy seven guitars. 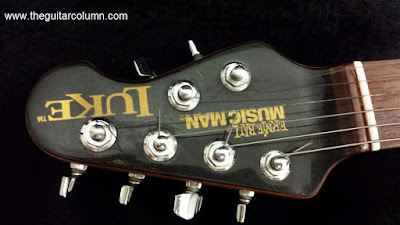 The many subsequent incarnations of the JEM series did not use the same neck profile as the Loch Ness and I could never understand why. It was as if someone decided to simply can it, the blueprints relegated to some secret archive in the Hoshino factory. 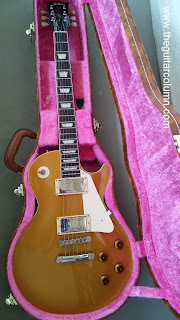 I was really happy when I reached into the softcase to pull out my guitar. There are some things you just cannot forget. 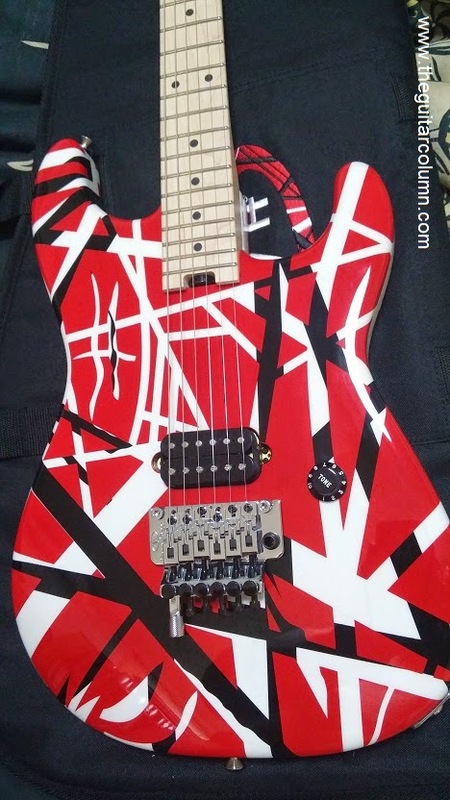 The neck profile on the EVH Striped Series is exactly like the one on the almost mythical Loch Ness JEM! The EVH's neck profile can best be described as a slim 'C', with beautifully rounded, rolled fingerboard edges. The glued-on maple fingerboard features a compound radius that goes from a Gibson-like 12" at the nut, to a very flat 16" at the fingerboard end, allowing for super-low action without fretting out when bending strings. I'm not an ultra-low action kinda guy -- I like a teeny bit of fight from the strings but they must still be low enough for me to throw in the occasional right-hand tapped legato run with ease. But just for a lark, I brought the EVH Floyd Rose down about as low as it would go, and the guitar still played very evenly, with no odd chokes or fret-outs at random points indicating that some fret were higher than others. 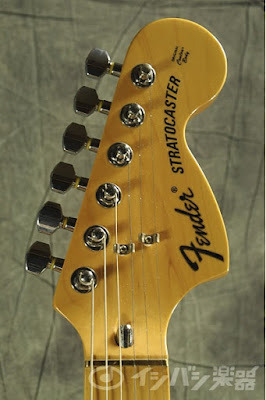 Kudos to Fender Mexico for the stellar fretwork. 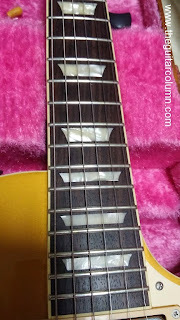 And did I mention that the jumbo frets on this guitar were polished to a chrome-like, mirror shine? 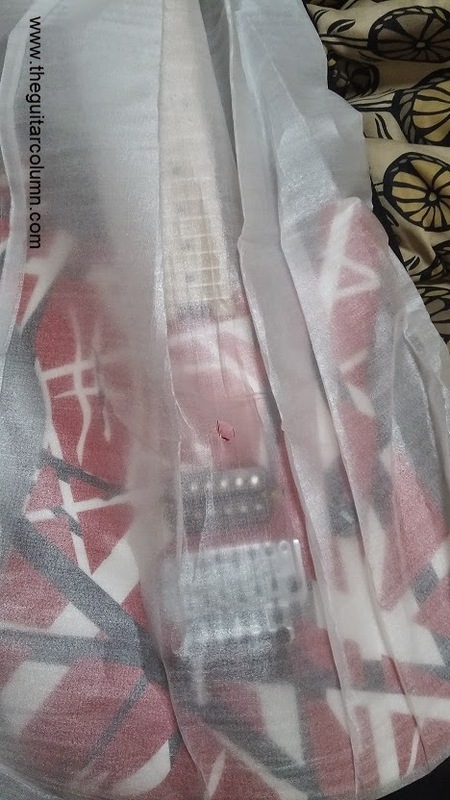 While waiting for my guitar to arrive in the mail, I came across a few negative reviews on a couple of guitar forums that said that the EVH Striped Series guitars came with sharp fret ends. This was not my experience with my own guitar, but I can understand why this might be the case for some. As I mentioned earlier, oil-finished maple necks are sometimes prone to expansion and contraction, depending on relative humidity. If the guitar has been stored in a relatively dry environment for several weeks, the wood is likely to contract, causing the fret ends to protrude slightly. 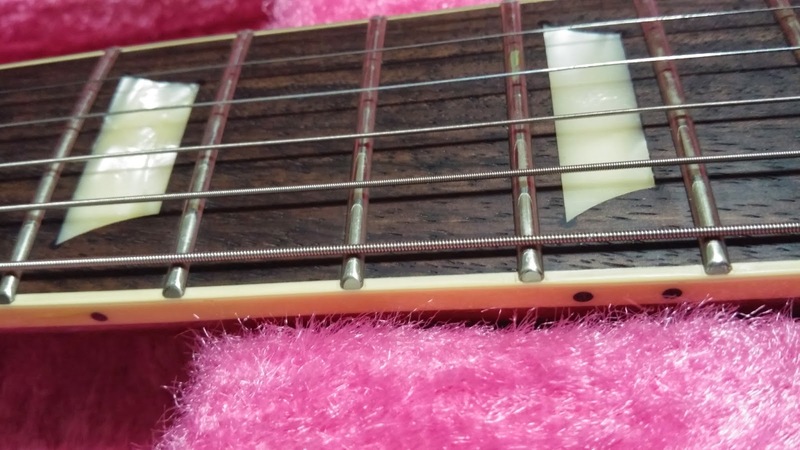 Some guitar manufacturers cut the fret tangs a little shorter at the fingerboard ends for this very reason. 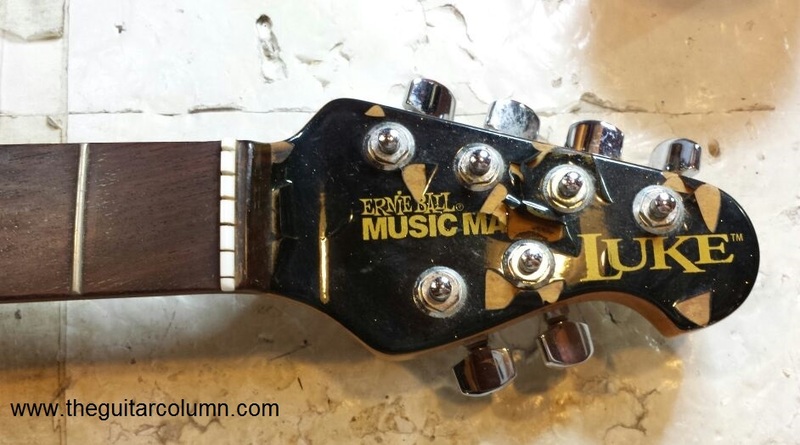 Fortunately this is something that can be easily fixed by any competent luthier or repairman. 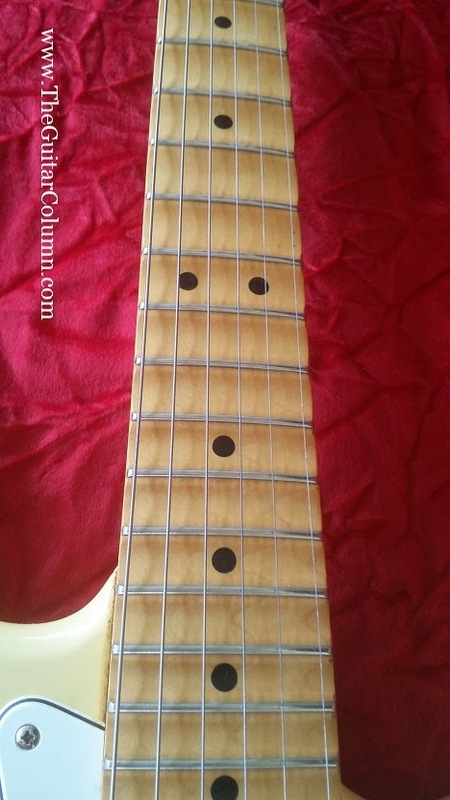 A quick buff of the fret ends with a fret rounding file, a dash of linseed oil to restore the finish on the fingerboard edges, and you're done. 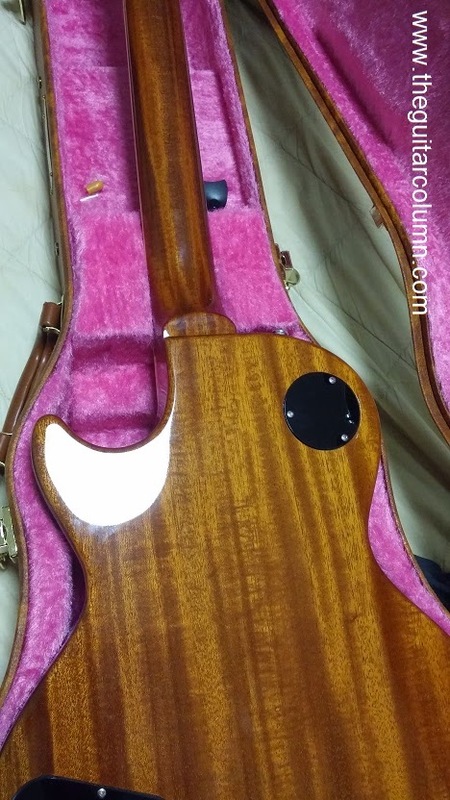 So what's with all the hype about oil-finished necks? 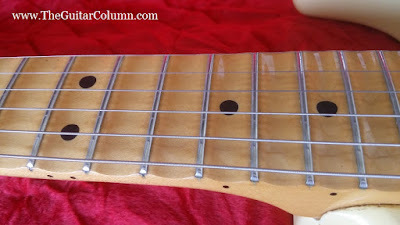 To put it simply, oil-finished necks feel as smooth as butter -- much smoother and silkier to the touch than any kind of man-made polyurethane satin finish. But like it or not, when the naturals oils from the hand react with the wood of the neck, it will start to darken up in some areas more than others. 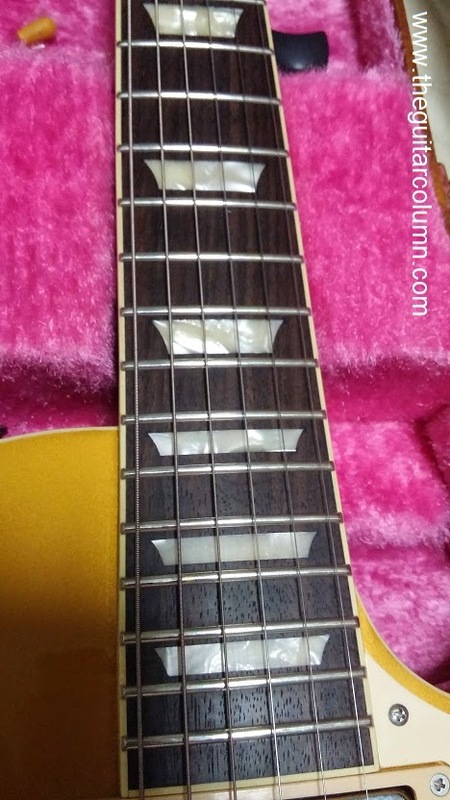 You can pretty much analyze a guitarist's playing style and even his knowledge of the fingerboard by looking at the grime marks on an oiled maple fingerboard after a couple of years. 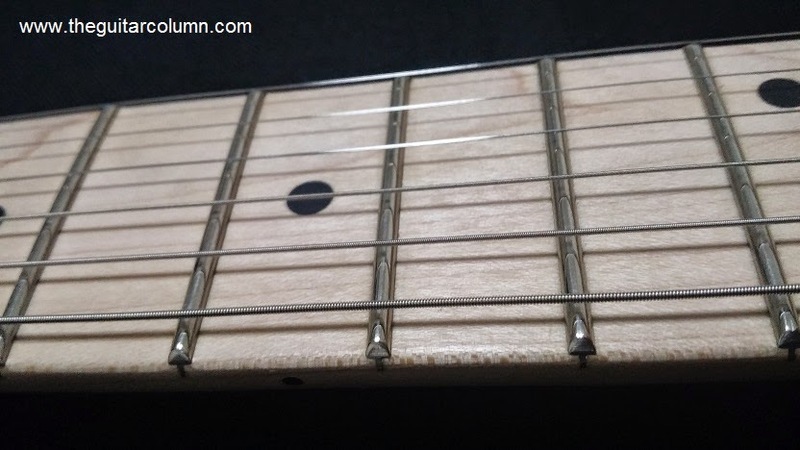 The more evenly marked, the more it shows he uses more of the fingerboard! 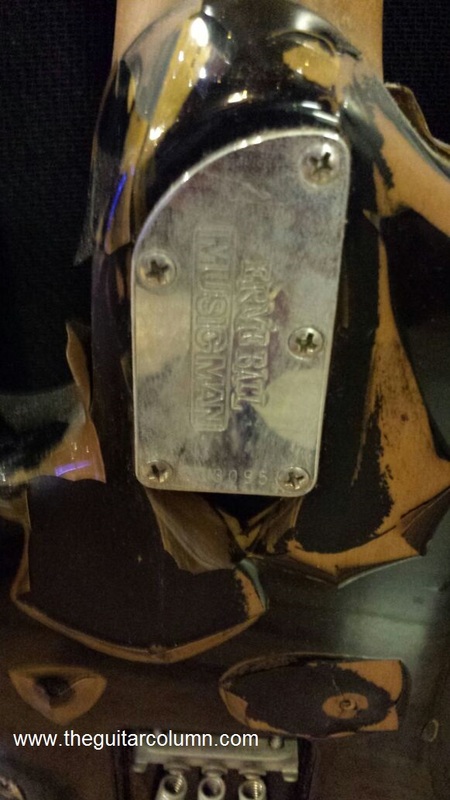 On my old black Ibanez JEM 77V, I sandpapered the finish off the back of the neck in an attempt to replicate the feel of the Loch Ness JEM I mentioned earlier. Despite being lightly finished, the back of that JEM 77V neck felt unusually 'hairy' with slightly raised grain. Strange. To counter the hairy, slightly rough feel, I buffed it down with very fine sandpaper and applied several coats of Warwick beeswax to seal the wood. I checked just now, and the contents of that one-and-a-half-decade old can of beeswax had solidified into clumps that resemble a broken yellow candle. 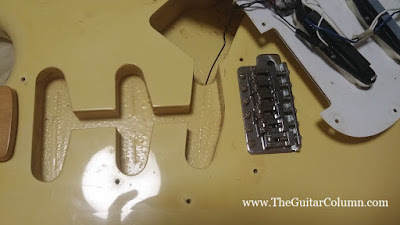 Guess I'll stick to Dr Duck's AxWax for general maintenance of the EVH neck. 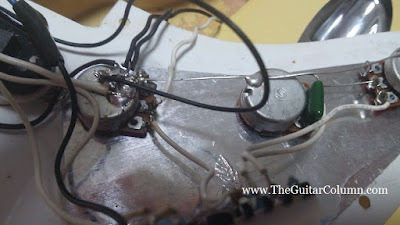 That, and as Ritchie Fliegler mentions in his book The Complete Guide To Guitar And Amp Maintenance, regular wipings of the back of the neck with oil from the forehead every morning! How's that for a personalized guitar? 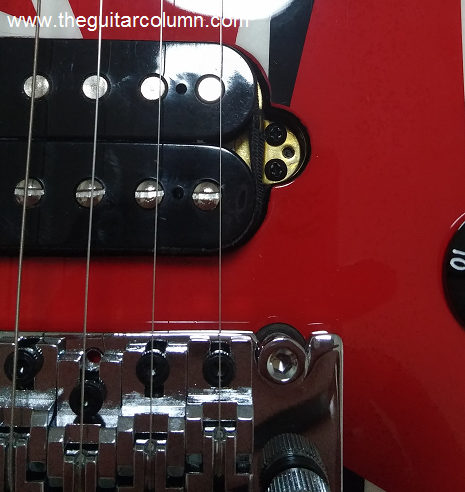 After playing the EVH for a couple of days at home and at one of my regular Monday night gigs, the fingerboard is starting to darken up in the more well played areas. 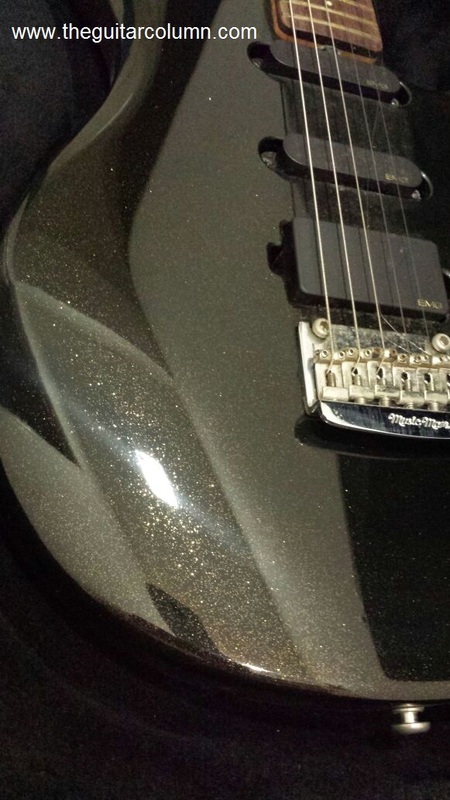 Not so much from finger grime, mind you, but from the black carbon residue from the factory-installed strings. 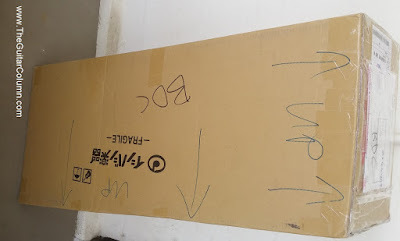 My fingertips were literally a gun-metal grey from playing the guitar out of the box for a couple of hours when it first arrived. Ok, maybe there was a wee bit of grime involved. 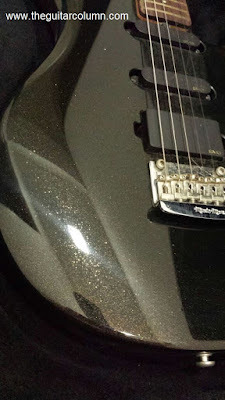 Before my guitar arrived I thought about taking some fine steel wool to the body to take away some of that glossy shine off from the polyurethane finish. Now that the guitar is in my hands, I kinda don't have the heart to. 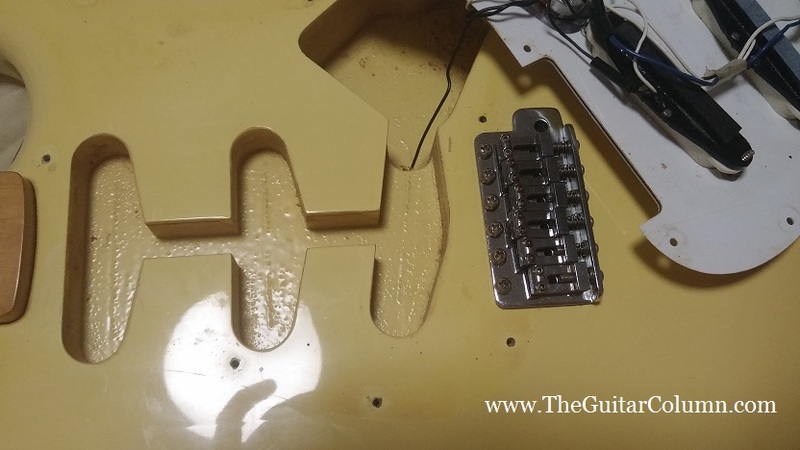 But I think that as the oil-finish starts to dirty up some more, it will save me from having to relic the body in any way -- a well-played dirtied up neck will take the eye away from the 'too new' poly finish body. 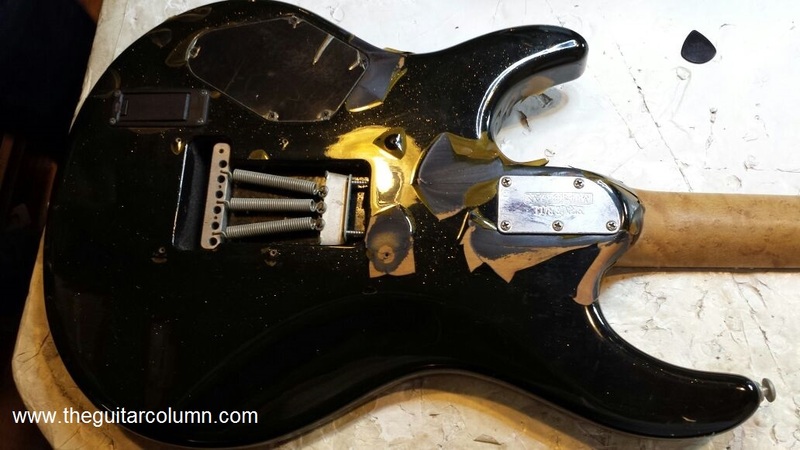 And we all know how awful it looks when a poly finish guitar body is relic'd. 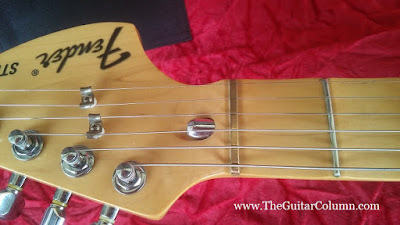 As I mentioned earlier, the EVH guitars feature a handy trussrod adjustment wheel at the base of the neck. No popping off the neck to do a simple truss rod adjustment. The wheel can be tightened or loosened accordingly using any metal object that can fit into the holes on the adjustment wheel and they have even provided a simple, slim hex-wrench for this purpose. 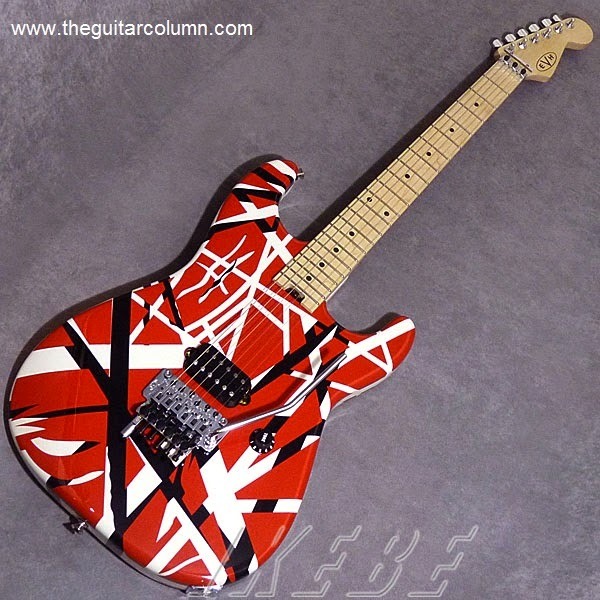 The EVH Striped Series just wouldn't look right without a Floyd Rose trem system. 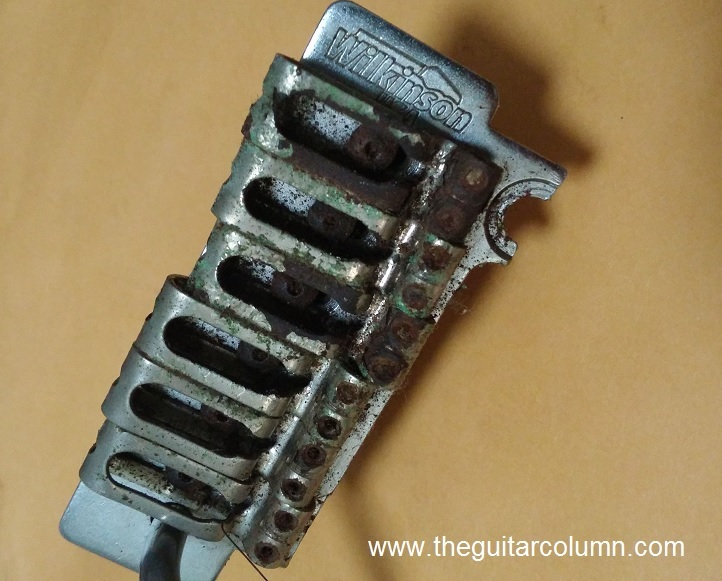 And the EVH-branded Floyd Rose that comes standard on these guitars is not some licensed cheap knock-off. According to the Floyd Rose website, the EVH Floyd is exactly the same as the German-made Floyd Rose Original, except that it is made in Korea. Same specs, different country of manufacture. 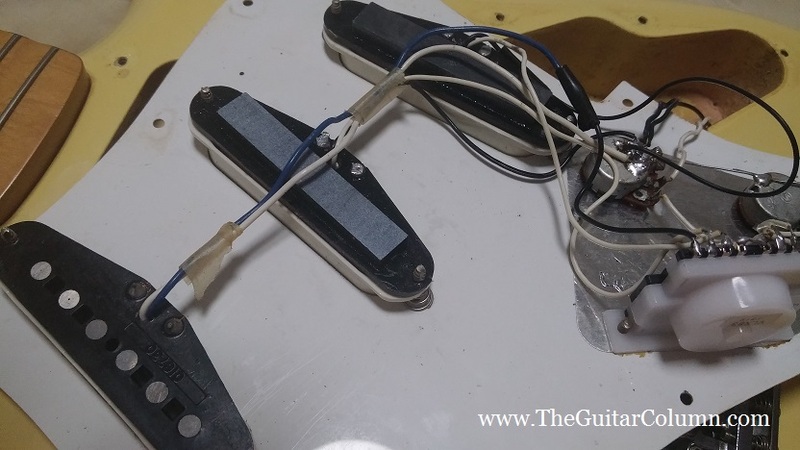 As stated on their website also, the EVH Floyd is OEM and made exclusively for the EVH line of guitars, meaning that you can't buy an EVH-branded Floyd Rose off the shelf. 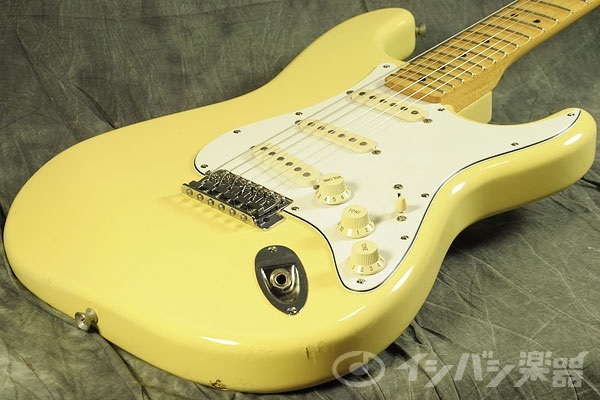 But if you do want to buy one, the equivalent model would be the Korean-made Floyd Rose 1000 series. And you've got to give it to the Koreans. 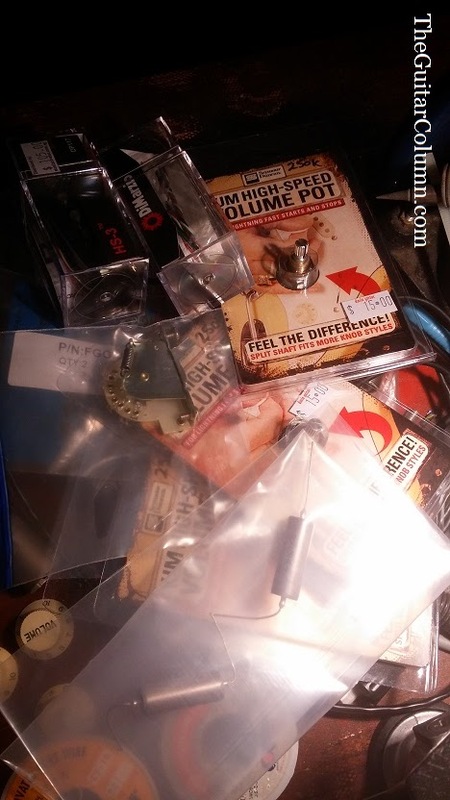 Aside from the hex wrenches needed for the bridge and locking nut screws, they even provided an additional regular length string lock screw and one more longer string lock screw that fits the D-Tuna! Which means also, that if you do not wish to have the D-Tuna installed, you can remove it and install the shorter string lock screw in its place, for a more traditional Floyd Rose look. The EVH-branded Floyd Rose tremelo also comes with a D-Tuna that allows you to instantly drop the low E string to a low D, just by pulling out on the knurled post attached to the low E string's locking screw. Of course, in order for the guitar to still be in tune when the D-Tuna is pulled, the entire bridge must have it's back end resting firmly on the body. If you set the Floyd to a floating position, activating the D-Tuna would throw all the other strings out of tune. I'm leaving the D-Tuna on mine for now to see how it works out in a live playing situation. 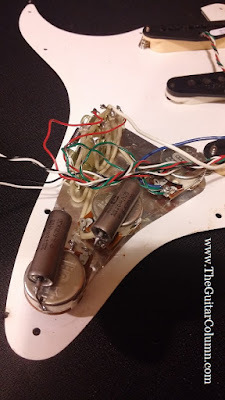 If not, then it's back to floating the trem and removing the D-Tuna. For good measure, and to ensure that there was minimal friction at the fulcrum points, I applied Rene Martinez's GraphitAll guitar lube to the Floyd's bridge posts and knife edges, really getting it in there with a toothpick. 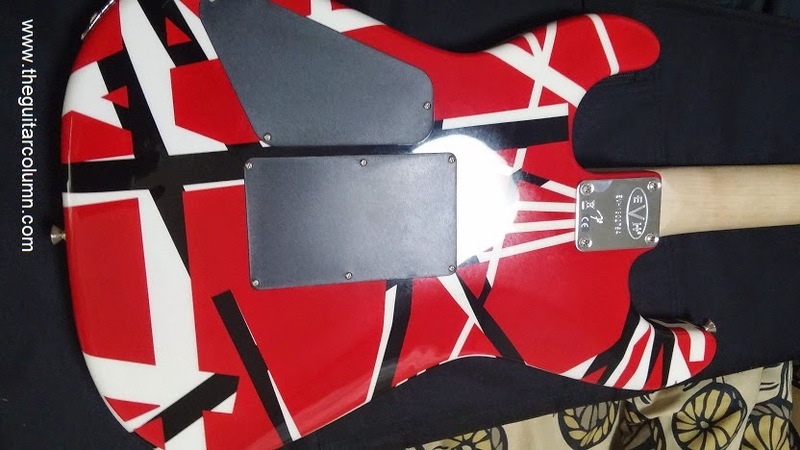 The stripes on the EVH finish were sprayed on one by one, in layers. Over an undercoat of primer, the body was first sprayed black. The black base coat was taped up and the entire body was sprayed white. When the tape was removed, the result was black stripes on a white body. More tape was applied and red paint was sprayed, again over entire body. When the tape was removed, the final red-white-black combination was achieved. What I find amazing is how Fender managed to replicate Eddie's original red-white-black finish down to the smallest detail, using tape just like he did. No easy task when you consider that the factory's finish department has to do exactly the same graphic on hundreds of guitars! 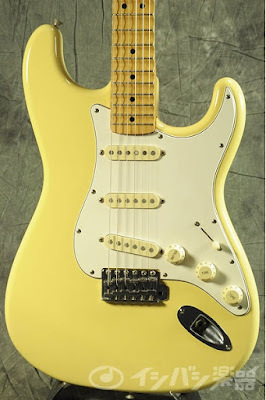 No wonder the Striped Series is made in Mexico -- American guitar factory workers would probably have gone on strike! 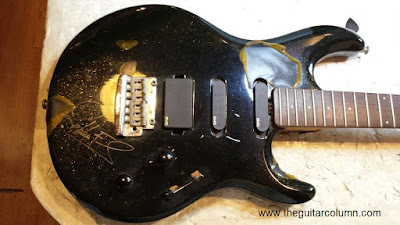 Eddie's original guitar -- the one featured on the cover of the Van Halen I -- started out as a white guitar with black stripes. 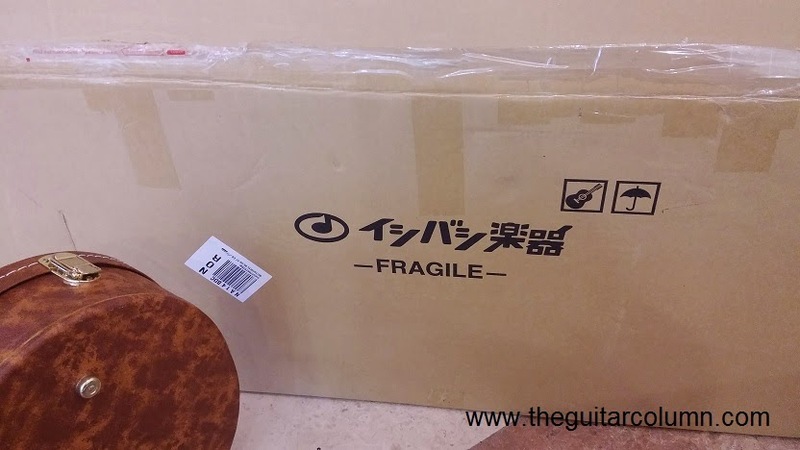 As his popularity exploded, he soon found his guitar being copied not only by fans but also by a few Japanese guitar companies who were making a few unlicensed 'tributes'. To throw them for a loop, he masked off certain areas of his black and white guitar with tape and sprayed everything red. When the tape was removed... well, you know the rest. Fender could have just gone with a single template and sprayed all the different colors on all at once, but it would probably have caused the colors to run into each other, and the lines would not look quite as crisp as if they were sprayed on one by one, with each color layer allowed to dry separately. And you can see this in the finish -- the lines look slightly raised at the edges where the tape was peeled off after each color was sprayed. 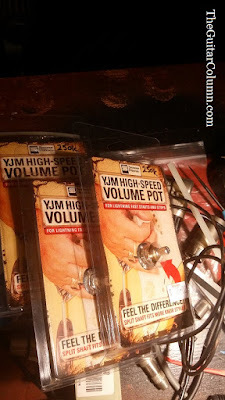 position with a single volume pot and no tone control. He has said that he cannibalized the pickup, an original PAF, from an old Gibson ES335 he owned and dipped it in paraffin wax to stop microphonic squeal. 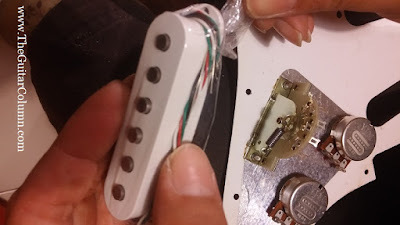 True to form, the bridge EVH Wolfgang humbucking pickup is screwed right to the body, but with two smaller Phillips screws on each side of the pickup instead of just one screw on each side. This makes for a very solid mount and I can't even get the pickup to move even a tiny bit back and forth when I grab on it! The EVH Wolfgang pickup features Alnico II magnets, have a DC resistance of 14K and are double wax-potted to ensure absolutely no microphonic squeal even at ear-shattering arena volumes. All this jibber-jabber would mean diddley-squat if the guitar didn't sound good. 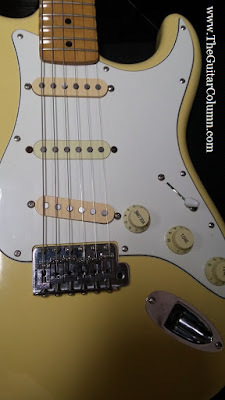 When I brought my EVH Striped series to my usual Monday night gig, I was a bit worried as to how it would fare tonally, with only a bridge pickup and a single volume control. My band's repertoire is pretty wide -- Hendrix, Cream, Zeppelin, Deep Purple, Pink Floyd -- and I do a fair amount of switching between the neck and bridge pickup during songs and on solos, along with much tweaking of the tone controls. To be honest, I didn't feel I was missing my neck pickup at all. Although to compensate, the worry wort in me decided that I needed to set each of my overdrive pedals differently, one brighter, and one much darker with the tone almost rolled off. But I found that I was fine with just hanging with one pedal into an early '90s Marshall SL-X head and cab the entire night. The Wolfgang pickup performed admirably, cleaning up nicely when I backed it off, and really laying on the juice when cranked. And that low-friction pot -- it'll get away from you if you're not careful! The EVH Striped series is, all in all, a joy to play. 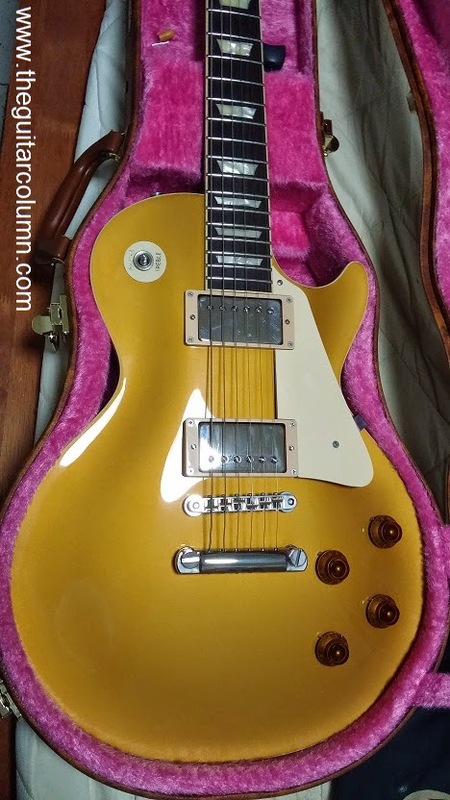 And if you've been jones'ing to dust off your Van Halen riffs and licks with some Floyd Rose divebombs and stratospheric harmonic screams thrown in, this guitar is for you!